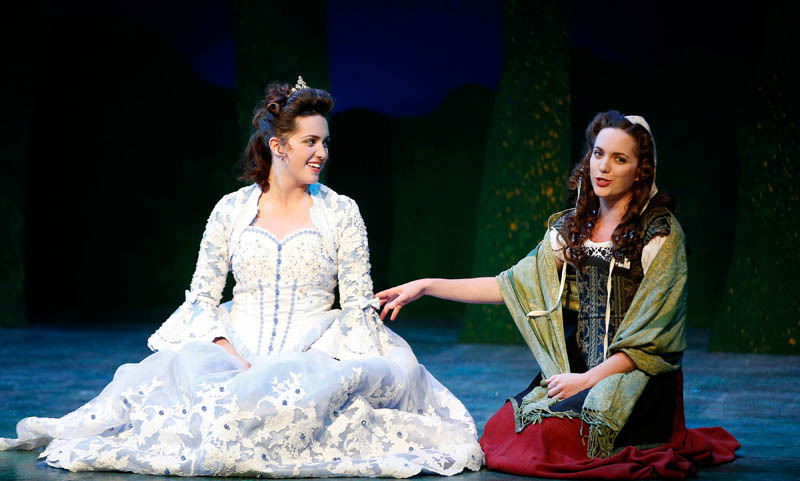 Stephen Sondheim’s “Into the Woods” is no mere grove of trees. As a production, it’s more like a sprawling national park. With its multiple story lines, challenging score and running time of 2½ hours, the mid-1980s musical should carry an advisory: Inexperienced theatre troupes may become overwhelmed. “Into the Woods” is every bit as beastly as the unseen Giant who terrorizes the forest in the second act. It’s a load for its cast and audience. GCU’s production of “Into the Woods” represents the best collection of student talent on the Ethington Theatre stage in four years. In fact, many amateur productions lop off the second act, settling for the “happily ever after” ending that comes at the close of the 90-minute first act. And that’s a shame, because the second act is when Sondheim has the most to say about the human condition. Thankfully, the Grand Canyon University version that opened a sold-out, six-show run on Friday night in Ethington Theatre is the unabridged Sondheim. It has everything an audience could want: a killer cast of GCU’s best student actors; superb direction and clever staging by Claude Pensis and Bill Symington, respectively; and music by a five-piece orchestra led by ubiquitous pianist Mark Fearey. “Into the Woods” brings the College of Fine Arts and Production full circle. In 2011, the spring musical was Sondheim’s quirky “The Frogs,” staged in the campus swimming pool and starring Adam Benavides, then a freshman. 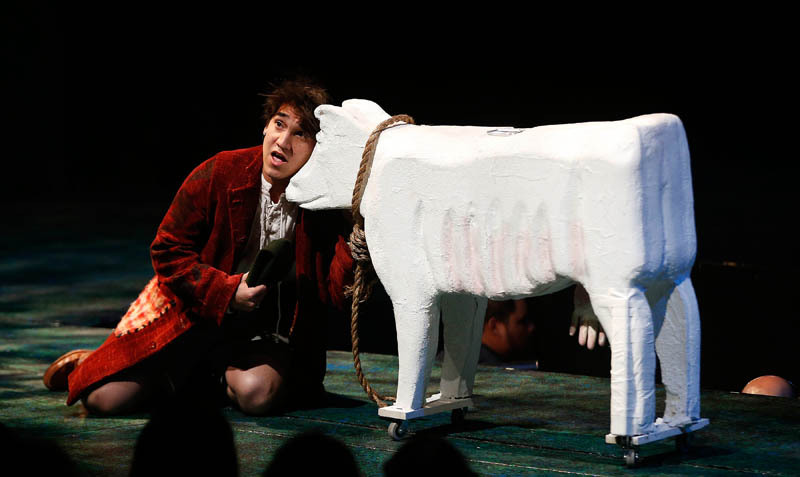 Benavides, now a graduating senior, is in this one, too — as Jack, the simple-minded boy of beanstalk fame who is overly attached to his milkless cow, Milky White. “Into the Woods” stands as the best of the four spring musicals, thanks to wonderful performances from students representing all four classes in the college. If there was any doubt before, then surely it is gone now with a show of this scale: The theatre program, steeped in talent, has made it all the way back from its 2006-09 hiatus, and collegiate productions don’t get any better than those at GCU. The word is out, and the sellouts are proof. With “Into the Woods,” Sondheim (still living at 84, by the way) mashes together the fairy tales “Cinderella” and “Jack and the Beanstalk” with his own story about a baker and his wife — the tale that holds it all together, describing the couple’s search in the woods for four items that will break a witch’s curse and bring them the child they desire. “Little Red Riding Hood” and “Rapunzel” also are thrown into the mix. 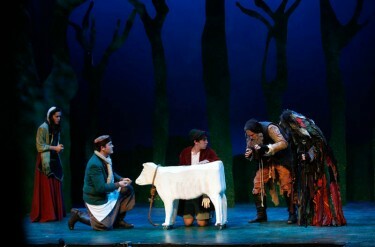 Sondheim both celebrates and skewers fairy tales, and the laughs arrive early and often. “Happily ever after” comes at a price for Cinderella (Joy Flatz), Jack, and the Baker (Gavin Ely) and his wife (Claire Flatz). In the second act, they and others experience the dire consequences of their behavior, and the finger-pointing among them reaches a fever pitch. In one memorable scene, the recriminations fly at a furious pace. There is plenty of hard-won wisdom to go around in the end. The cast of two dozen performers is simply the best that the Ethington stage has seen in four years. The Flatz twins are fabulous and seem made for musicals (they stole the show as freshmen in “The Boy Friend”). Ely, another junior, has had a big year, first with the Mozart opera “Cosi fan tutte” and now this production. His sweet tenor is arguably the best male voice in the Music Department. Junior Josh Vanderpoel turns in a fine performance as the weird-but-wise Mysterious Man, his latest in an impressive range of work this season (“Twelfth Night,” “Ah, Wilderness!” and “The Lion, the Witch and the Wardrobe”). Junior Megan Sprink VanCamp is a dazzling Witch in a demanding role that was played on Broadway by Bernadette Peters. Freshman Dominic Baxter and junior Taylor Kortman are hilarious as a pair of empty-headed, pretty-boy princes (their duet, “Agony,” is a highlight). Even the smaller roles of Rapunzel and Cinderella’s mother are sung beautifully by seniors Natalie Shuler and Ashley Hines, respectively. Then there are sophomores Devyn Garrett (Florinda) and Rachel Callahan (Little Red Riding Hood), junior Cole Brackney (the Wolf) and narrator Javier Gonzalez — all solid. See what we mean? Talent in droves. As Jack, senior Adam Benavides puts the wraps on four years of strong performances at GCU. A final word about Benavides: His work over four years at GCU has been sensational. He handled meaty roles with ease as a freshman, yet his subsequent performances still reflected growth and maturity. In a theatre program that has thoroughly distinguished itself, he has been at the forefront. His tousle-haired Jack, played with the nuance we have come to expect from him, is a nice sendoff, and he nails the character’s signature song, “Giants in the Sky.” He can do it all, and he will be missed. Somehow, the limitations of tiny Ethington never seem to confound Symington, who put much of the big “Woods” set on wheels (including Jack’s cow and a horse). To accommodate the orchestra pit and still give the actors adequate room to work, he built an extension along the front of the stage. As usual, not a foot of space is wasted. The work of Symington, his technical assistant Jeff Jann, lighting designer Rose Malone, costume designer Nola Yergen, and hair and makeup designers Allison Bauer, Rebekah Dipple and Kay Gray adds up this time — and every time, truthfully — to a show that’s a knockout. The final three performances of “Into the Woods” will be at 7:30 p.m. Friday and Saturday and 2 p.m. Sunday. A reunion of the cast from GCU’s 1999 production of the show is planned for Sunday. Click here for a slideshow of photos from the production.